Oh what a difference an extra day makes to the weekend! A chance to break out of our usual routine and relax a little more. And the weather certainly helped as we were blessed with three days of dry weather and some sunshine as well. It has rained all day today but wouldn't you call that fair play? So, joining in with Jen from little birdie for week 35, here's my four particular happy moments. 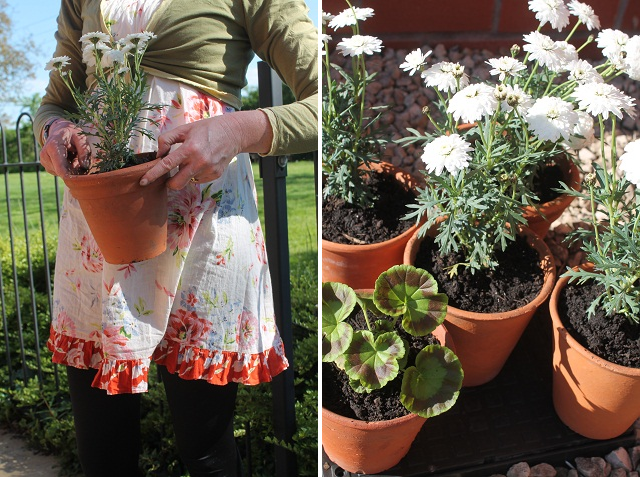 ♥ Finding cheap terracotta pots and plants at the car boot sale. I wanted some small pots to cover a manhole cover at the front of our house and was delighted to find some. I love white flowers in pots and a geranium always pretties up an outdoor table, don't you think? ♥ A new addition to my summer wardrobe. I found this floaty tunic on my way out of the car boot sale. Just the perfect length to wear over leggings and a bargain at £1. Yes it was an impulse buy, but I was drawn to its colours and I know I'll wear it a lot. The lovely lady who sold it to me said it was clean but not ironed and having washed it myself I now fully intend not to iron it either :) That makes it a definite keeper in my summer minimalist wardrobe. ♥ Spotting the first azaleas in our local woods. I can't wait to see more of these beauties bloom over the next few weeks. Thank you all for reading and welcome to my new followers. Such a pretty tunic, it caught my eye even before I read your post. Wonderful that you found what you needed for the garden at the car boot sale Claire - and the bonus of the tunic! Loved your previous post on Minimalism and yes I find reading minimalist blogs very inspiring. Miss Minimalist was the first one I read and I also like The Minimalists although I would not realistically be able to reduce my possessions to their level. Small Notebook is one I have found to be a more moderate but still helpful blog and of course I would recommend yours most highly! Oh Claire I'm sorry to say that we have taken our house off the market at the moment as the offers we received were well below what we or the agent know the house is worth. The two couples making the offers were outraged that we withdrew it but were bargain hunters according to the agent and he supported our decision. Sorry to hear this but as it's a stressful process you've made the right decision, I'm sure. You'll be so ready to downsize when the time comes! Sounds like you had a wonderful long weekend, like the look of your new plants.